Being a small keyboard, multimedia and gaming functions are a little limited but Corsair has still managed to fit in all the essentials. Up in the top right corner are a couple of large and satisfyingly tactile (though not mechanical) buttons for controlling volume, alongside a couple of smaller buttons for mute and turning off the Windows key. 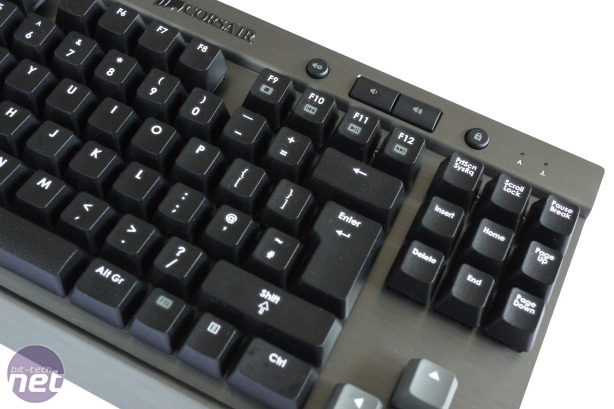 Below these, the F9-F12 keys also double as Stop, Skip Back, Play and Skip Forwards buttons, activated via the function key that replaces the right side Windows key. There are no dedicated macro keys but through the use of Corsair’s software, game/app profiles and key combinations it’s still possible to get a decent amount of automation from this keyboard. The key switches used here are Cherry Reds which use a smooth (linear) light action, requiring just 45g of force to actuate. This makes it an incredibly speedy and easy keyboard to type on, something which is helped by the surface of the keys. The spacebar uses a rough and dimpled finish while the rest of the keys have a more conventional rough finish, but the overall effect is very, very good. Unlike some of the more expensive models, no highly-contoured WASD keys are provided but we’ve never found them to be of much use anyway. The keys are removable, though, if you would prefer to replace some. The keyboard also supports full anti-ghosting and rollover so won't come a cropper if too many keys are pressed at once. Perhaps the most notable omission from this keyboard though is its lack of backlighting. It’s almost the case that once you’ve used a backlit keyboard you never go back to a non-backlit model but actually we so liked the many other aspects of this keyboard that we found it far less of an issue. What’s more the more defined contouring and layout of a desktop keyboard means it’s far easier to find your way in the dark, compared to non-backlit laptop keyboards. As to the overall idea of this being a portable keyboard, well we must admit to not encountering any scenarios where we would actually take a separate keyboard (to accompany a laptop) with us during our review time, despite holidaying, visiting family and travelling for work. The only obvious scenarios that we can think of where you’d take a separate keyboard would be either extended work trips or LAN parties/events. Nonetheless, clearly it is considerably easier to transport than a fullsize alternative, and a vast improvement on any laptop keyboard, or having to use a crummy membrane desktop keyboard. 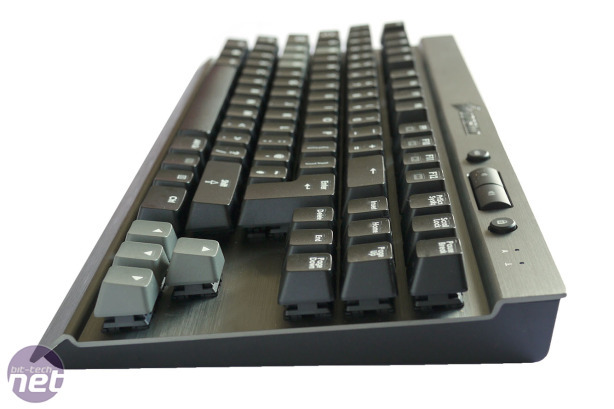 Alternatives to the Corsair K65 are fairly limited with few options that offer mechanical switches and a tenkeyless design. 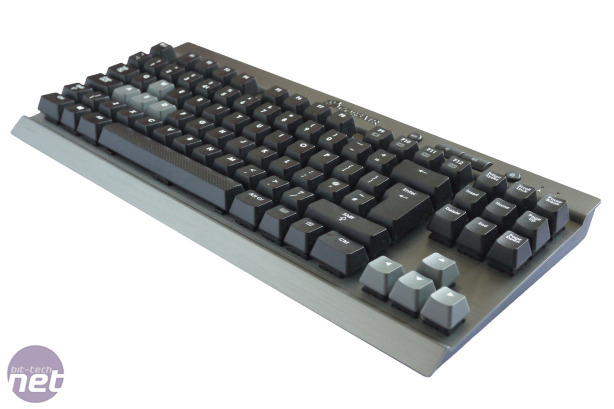 One is the Excellent Filco Majestouch-2 tenkeyless, but it's a whopping £95 and has no multimedia features. 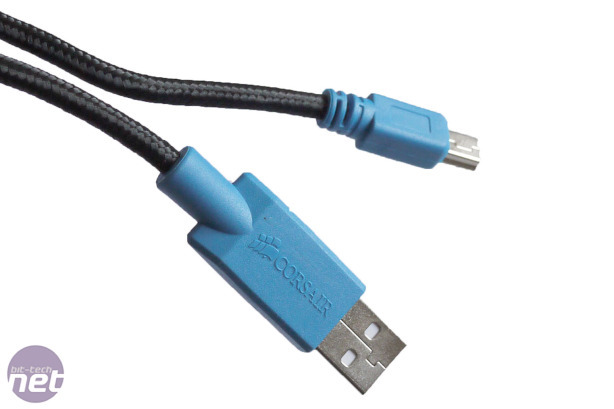 It is available in a funky Ninja version that uses hidden labels, though. The Corsair K65 isn’t going to be for everyone, with some simply not wanting to do without their numpad and others put off by the lack of backlighting and macro keys. But if you don't absolutely need these features then we can wholeheartedly recommend it. It’s ruggedly stylish, compact, competitively priced, an utter pleasure to type on and, yes, it is that bit more suitable as a travelling companion.